Back-to-school season is in full swing and Morgan State University (MSU) assistant professor and award-winning journalist Dr. Stacey Patton has already raised more than $10,000 to help financially-strapped students purchase their textbooks this semester. Through Patton’s annual Ida B. Wells-Barnett Textbook Fund — now in its third year since she arrived at MSU in 2015 — she helps nearly 40 students across academic disciplines who attend the Baltimore-based historically Black university. Students receive a maximum of $250 to purchase their books from Amazon.com or MSU’s campus bookstore. For the 2017-18 academic year, the College Board placed the average cost of textbooks between $1,220 and $1,400. MSU, like other HBCUs, serves a significant population of first-generation and low-income students, many of whom are food or housing insecure, children of incarcerated parents or are working while in school. When Patton arrives on campus the first week of every semester, “I have a long line of students waiting just for books,” she said. Patton shared that she has had struggling students come to her office hours four of five weeks into the semester embarrassed or ashamed to tell her that they did not have a textbook. “I just noticed that this was a theme semester after semester, so I would end up letting them borrow my copy or photocopy pages,” she said. Some colleges and professors keen to exorbitant textbook costs have begun to shy away from assigning textbooks, Patton added, and have shifted to giving students reading packets or PDFs of readings, or they are providing materials online. Now, the annual Ida B. Wells-Barnett Textbook Fund at MSU “exists within that context,” Patton said. Morgan’s president Dr. David Wilson said that he is always impressed when he reads about what faculty and staff do to ensure that students stay on course to receive their degrees from the institution. Although Patton’s textbook fund is not managed or overseen by MSU, “it is demonstrative of her commitment to the success of students we serve. Every little bit helps” Wilson added. 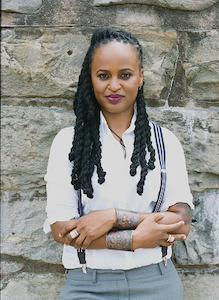 Supporting, serving and advocating for students has been a mission for Patton throughout her academic studies at New York University (NYU), her journalism career at organizations including The Chronicle of Higher Education and her teaching career at Montclair State University, American University and Morgan State. As a former foster youth attending Johns Hopkins University and then NYU for her bachelor’s degree in journalism, Patton was fortunate to have generous benefactors put their credit card on file at the bookstore for her to purchase her books every semester. She decided to pay it forward. While at NYU, she won the Hearst Award — essentially the college Pulitzer Prize Award — for her feature writing and received $10,000. The university received a matching grant in the same amount. Patton told to the chair of her department to use the $10,000-grant for book awards, specifically for Black graduate students, she said. And instead of naming the awards after her, she also asked for the book awards to be named in honor of Ida B. Wells-Barnett. For “two years straight, Black graduate students got those funds,” Patton said, adding that because Ida B. Wells-Barnett was an “all-around hero” as a journalist and activist to her, “it’s totally appropriate” to name the current MSU textbook fund for her, too. MSU students from the business school, the science, technology, engineering and mathematics disciplines and more have received book awards from Patton over the years. Students who receive book awards — sometimes repeat students — often share their stories, and many say receiving funding for their books is “a burden lifted off of their shoulders,” Patton said. Some of them are surprised to see that someone cares for them, and others tear up. “I get lots of hugs, which is nice,” Patton added. Beyond book awards, Patton raises funds for students taking her Digital Media courses so they can secure digital equipment such as tripods, digital backpacks, external hard drives and lavalier microphones. This effort is “so HBCU students can compete with [predominantly White institutions] that have fancy labs and equipment and cameras,” she said. “Sometimes, that’s the only thing that separates our students from theirs; it’s the resources and the equipment,” Patton added. She challenges the notion she has previously heard from various media outlets, that newsrooms cannot find qualified journalists or interns of color, by preparing her students to enter the field of journalism and communications. She said that she works with her students to ensure that they are ready to enter the job market or go on to graduate school once graduation approaches. “It’s preparing them to tell our stories — the stories of our communities — and producing counter narratives as well,” she said.